were two poems by Emma Lazarus. 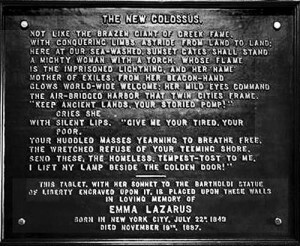 Most people know that her poem “The New Colossus”, which is printed at the foot of the statue of liberty. What is less known is that she was Jewish Sephardic and wrote most of her poems about Jewish themes. If you want to learn more about the Jewish side of Emma Lazarus, I recommend this book by Esther Schor. She gave a fascinating talk at the Museum of Jewish Heritage in New York while it was hosting an Emma Lazarus exhibit. First, lets read “The New Colossus”. Prince, priest, and people, spurned by zealot hate. Saying, “Ho, all who weary, enter here! There is also an interesting reference in the “golden door”. 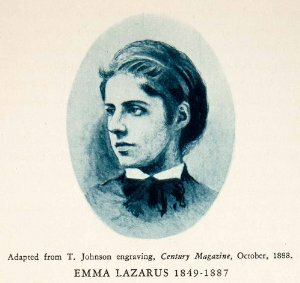 Emma Lazarus was an avid Bible reader and wrote a poem called The New Ezekiel. With that in mind, it is not unreasonable to interpret “golden door” as a reference to “golden gate”. City Walls. 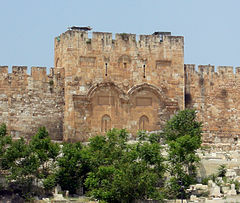 According to Jewish tradition, the Shekhinah (שכינה) (Divine Presence) used to appear through this gate, and will appear again when the Messiah comes (Ezekiel 44:1–3) and a new gate replaces the present one; that is why Jews used to pray for mercy at the former gate at this location. Hence the name Sha’ar HaRachamim (שער הרחמים), the Gate of Mercy. You can find the complete poems of Emma Lazarus here. You can also find online the Jewish Medieval poems and prose Emma Lazarus translated from Spanish including Yehuda Halevi and others here. Previous PostPrev Article Is God Abstract or Concrete?